View More In Outlet Switches. Multi-purpose device: Worry about overcharging? Forget to turn on/off the washer/dryer? Forget to shut things down? Want to give the appearance of someone is home? Avacom Wireless Smart Plug can help you control your home appliances, eliminate wasteful standby power and reduce energy use. Save on your electric bills and extend product life. Certified and Safe: FCC CE RoHS Certified makes it more trustworthy. Easy to set up: No need for electricians or tech geek knowledge to install and use our smart home devices. Hands-free voice control: You'll be able to control appliances with your voice. Create schedules: allows you to create customized schedules for your appliances. Energy saving: Keeps energy usage low when you're not home. Avacom WiFi Smart Plug compatible With Alexa Echo / Google Home / NEST / IFTTT Devices. No Hub or subscription required. Please use our user guide to pair devices with our eWeLink App. After that, you can use any of supported apps. Download a FREE APP you prefer (Amazon Alexa, Google Home, IFTTT, NEST or our EWeLink app). Please note: Google Home app requires Google Home device (Like Home, Mini, Max). Only supports 802.11b/g/n 2.4GHz WiFi, does not support 5.0GHz Wi-Fi. Working Temperature: 32°F - 100ºF or 0°C～40°C. 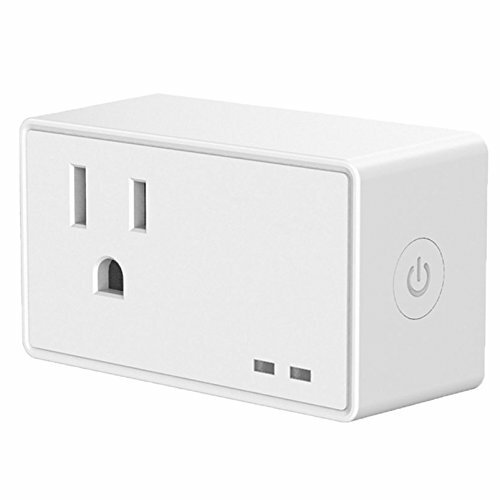 SIMPLE INSTALLATION: Plug-in to outlet, use our detailed User Guide to connect to your Wi-Fi network and pair device with eWeLink App. Use it with an APP you prefer (Amazon Alexa, Google Home, IFTTT, NEST or EWeLink). Easily share access with your family or any other devices. SAFE AND CERTIFIED: No more burned appliances. Protect your devices from damage by overload voltage surges. FCC, UL and ROHS Listed, High-Quality Chips. Works with 90~265V AC Voltage. 10A Max Load. REMOTE VOICE CONTROL: You won't worry about forgetting to power off your devices. Gain a peace of mind by controlling your appliances and electronics remotely anywhere at anytime. Even when you are not at home. You can do it with your voice, even without touching your phone. TIMER SCENES AND SCHEDULE: Your devices will work when YOU need them to work by scheduling turning on/off at specific times. Control multiple outlets with a single button utilizing Scene Feature or turn off your device with a delay using Timer Function. SATISFACTION GUARANTEE: Your satisfaction is our priority. If you are not satisfied - return your order within 30 days after delivery for a full refund. Like it? One Year Warranty and Lifetime Support will help you to enjoy it for a long time. If you have any questions about this product by Avacom, contact us by completing and submitting the form below. If you are looking for a specif part number, please include it with your message.